Overfeeding is the most common mistake fish owners make, and it can lead to a multitude of serious problems in the aquarium and for its inhabitants. Overfeeding clogs the filter, and breaks down into toxins that are harmful to fish. This is why fish food packaging includes clear warnings regarding the dangers of over-feeding. In nature, fish search for food when are hungry but will also eat whenever food is available. If food sources are plentiful, they will eat several times a day. On the other hand, if food sources are scarce, fish might go for days between meals with no ill effects. For this reason, fish are very opportunistic and will eat whenever they have a chance. Whenever you offer them food, aquarium fish will usually gobble it up even if they aren't in need of nutrition. Keep that in mind the next time your fish appears to "beg" for food. Fish quickly learn who brings the food to the tank and will jump at the chance to be fed, even if they are not in dire need. Feeding your fish too often or offering them too much food can lead to several problems. Both excessive digestive wastes and uneaten food can pollute the water and create high nitrate levels that in turn lower oxygen levels in the tank, as well as lower pH levels. If your water tests show high nitrate levels, it is very likely because you are over-feeding your fish. Further, excessive food floating in the water can clog filters, causing the water to become toxic. The correct frequency of feeding will vary based on the species of fish. In general, most fish do quite well on one feeding per day. Most fish require 16 to 24 hours to fully digest the food they eat, so a once-a-day feeding is quite sufficient. However, some owners prefer to feed their fish very lightly twice a day. Regardless of if you use one or two feedings, the key is to keep the feedings very small. The timing is not critical, with the exception species that are nocturnal feeders, such as certain catfish. 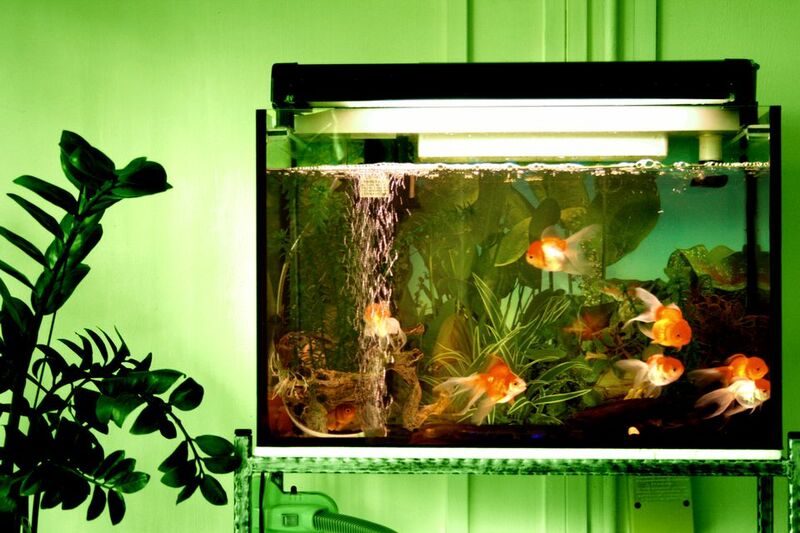 If you have nocturnal fish in your tank, be sure to feed them just before turning the lights out at night. There are some exceptions to the once-per-day feeding rule. Herbivores (vegetarians) need to eat frequently because they do not have large stomachs to hold a lot of food. In nature, they graze all day long on plants that are readily and have no need to gorge opportunistically. These species should be given several small feedings a day or provided with live plants they can nibble on constantly. Also, newly hatched fry and young fish not fully grown require more frequent feedings of special foods designed for fry. As for how much food to feed, a good rule of thumb is to feed no more than the fish will consume completely in less than five minutes. When in doubt, underfeed! You can always give them another small feeding if necessary. However, if you overfeed, the uneaten food will produce by-products that can be harmful to the fish. In the event that you do overfeed, promptly remove the uneaten food from the tank using a siphon or net. If you see browning, rotting food material hovering near the bottom of the tank, it is a clear sign you are overfeeding. This can lead to elevated ammonia levels in the tank and serious health consequences for your fish. Like any species, overfed fish may become obese and bloated. Store your fish food in a cool place to maintain its vitamin value and ensure your fish get the maximum nutritional value from the sparse once-a-day feedings. It's also best to buy small amounts, a month's supply at a time, to prevent the food from losing its nutritional value. As a final note, keep in mind that not only the amount but the type of food is important. Research fish species to determine which type of food is appropriate to the fish you keep. Some fish foods are specific to species, while others may be tailored to freshwater fish or saltwater species. Whatever food you choose, make sure it is balanced to provide the vitamins, protein, and minerals your fish need. Small amounts of good nutritional food are much better for your fish than large amounts of cheap food.